Most British businesses dispose of their old computer equipment without recycling, according to a leading waste management company. According to recycling experts Business Waste, up to 95% of companies still send their electronic waste to landfill rather that make arrangements for it to be collected, reused or recycled. Worse, many businesses are unaware of regulations regarding the disposal of electrical and electronic equipment, despite their long-standing implementation in the UK and across Europe. “We’re seeing more and more electronic waste being inappropriately discarded,” Said BusinessWaste.co.uk ‘s Commercial Director Mark Hall, “In fact, e-waste is currently the fastest growing type of waste that companies like ours handle”. According to Business Waste one of the major reasons that companies are reluctant to recycle their old computer goods is that they are concerned over data security. “Nervous bosses are worried that their data could fall into the wrong hands if it is sent for recycling,” said Mr Hall. 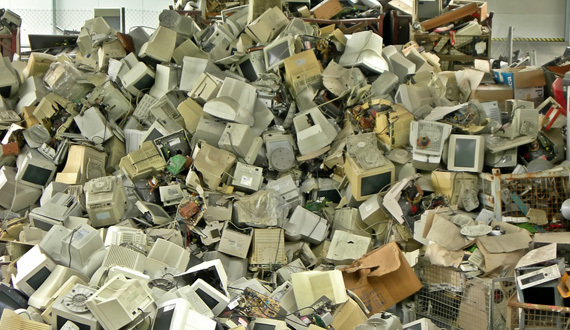 BusinessWaste.co.uk assures companies that this is not the case: Responsible businesses would ensure that their data is completely wiped from electronic equipment, and ethical disposal services provide an additional layer of security. “We’ve stood by and watched as employees set about perfectly good but ageing equipment with hammers, and they shouldn’t have to waste these resources,” said Mark. Unfortunately, companies are either unaware that ethical disposable facilities exist, or choose not to use them. Not only are some parts of electronic waste considered hazardous, but there is a tremendous investment in energy and resources required to build new. It takes nearly a quarter of a ton of fossil fuel, 48 pounds of chemicals, and a ton and a half of water to manufacture one computer and monitor.